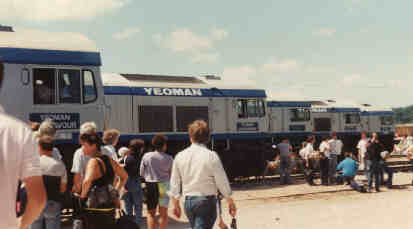 Top: Foster Yeoman were the first to run their own locos over the then BR system hauling their stone trains. This view is is of the 5 Class 59s, which were US built by General Motors Electro Motive division. They have a creep control system, controlled by doppler radar which enables them to put the maximum power down on starting through controlled wheel spin. 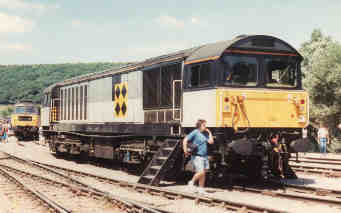 Next: British Rail's then latest heavy freight loco was the Class 58, represented at the Open Day by 58012. Next: The predecessor of the Class 58 was the Class 56, represented by 56031 with several others behind. 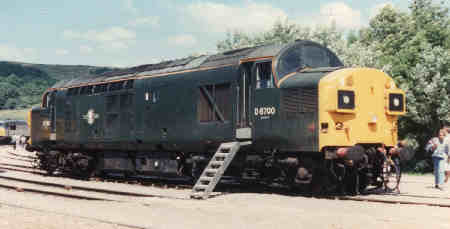 Bottom: A celebrity visitor was D6700, the first example of Class 37, which had been restored to it's original green livery and pre TOPS number.